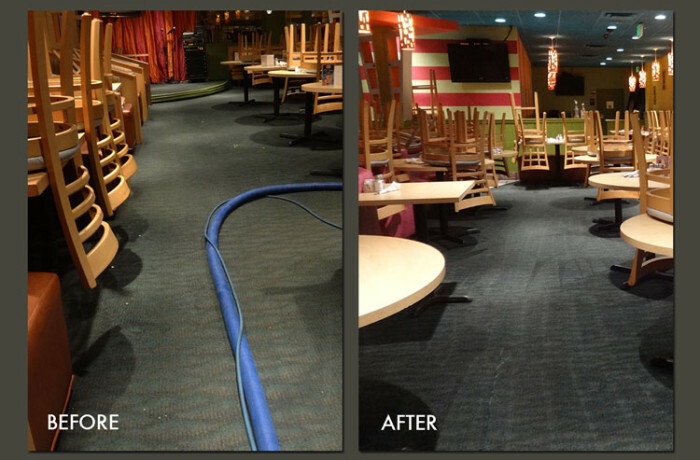 Of all the commercial carpet cleaning jobs, the most challenging are restaurants. Servers track cooking greases from the kitchen, and even with high-quality mats, airborne grease distributes a fine layer of oil on all the surfaces, but especially porous surfaces like carpet. When grease collects on carpet fibers, it attracts dirt, dust, and other contaminants. In addition, customers spill drinks, syrup, condiments, and other substances, leaving spots that can quickly turn into stains. Smart restaurant owners and managers know that carpet cleaning is an important part of maintaining the overall cleanliness and professionalism of the establishment so that guests feel welcome and comfortable. At Residential Express, can handle a wide variety of carpet cleaning challenges for restaurant owners. From trouble spots and odors to the regular dirt and grit that comes with high-traffic use, our powerful deep-cleaning equipment and solutions make a beautiful, clean, and healthy difference. Notice the dramatic difference between the BEFORE and AFTER images. First, we pre-treated problem areas with our exclusive cleaning solution, giving ample “dwell time,” that is, time for the solutions to soak into the carpet fibers. Then we used our powerful, but safe, and extremely effective steam cleaning equipment to flush dirt, oils, and other substances from the carpet, achieving a deep down clean. Our processes leave carpets with surprisingly less moisture than one would expect and absolutely no sticky residues. Our new client was very happy with the outcome and asked us to return for regularly scheduled carpet cleaning services. For a FREE estimate on restaurant carpet cleaning services in Orlando, Windermere, Dr. Phillips, Bay Hill, Apopka, Maitland, Winter Garden, Gotha, Ocoee, or Clermont, use our contact form or call (407) 947-1416 today.